Copies of the July 3, 2014 issue of the Times-Tribune are available at our offices. 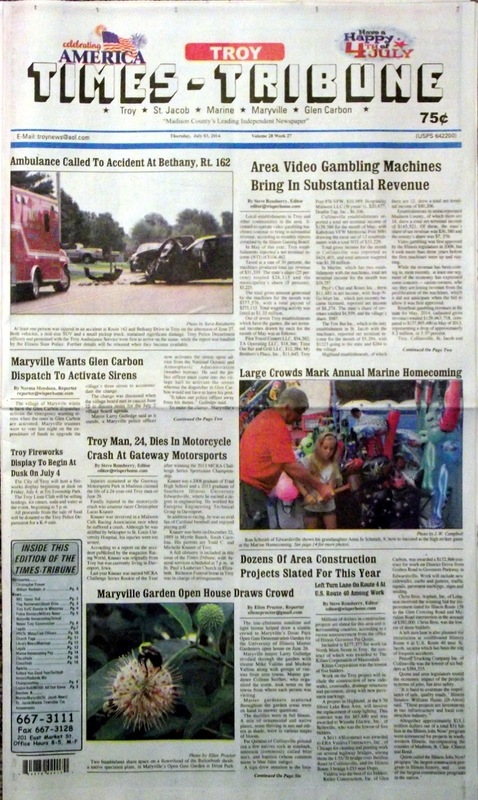 Some of the headlines in this issue: Area Video Gambling Machines Bring in Substantial Revenue, Maryville Wants Glen Carbon Dispatch to Activate Sirens, Troy Man Dies at Gateway Motorsports, Area Construction Projects Announced, Maryville Garden Open House Draws Crowd, Construction in Troy Surpasses Last Year, MERBL All-Stars Clash; Plus we have the latest police blotters, events announcements, a column about life in 1776, a full page of photos on the Marine Homecoming, and a whole lot more! We have obituary listings for Christopher Lucas Knauer and William Recklein Jr.